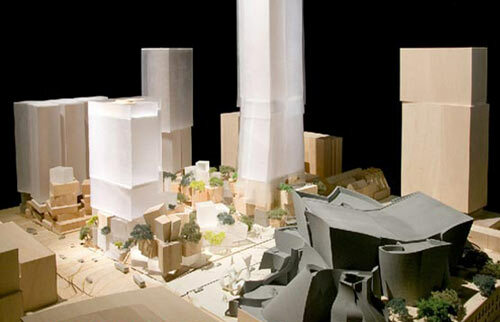 Lot's of Downtown Biz Buzz on the Mandarin Oriental Hotel Group's "announcement of intent" to manage the first 20 floors of the 48-story Frank Gehry designed tower. The upper floors will be residential units for sale... Now downtown will have towers over Grand Ave's "50,000-square-foot specialty food market, a major bookstore, a food hall, a 35,000-square-foot premier health club, a 25,000-square-foot event facility" and L.A. Live's "multi-faceted entertainment venues, restaurants, retail commercial and residential spaces, television and radio broadcast studios, and concert spaces"...No word on the Grand Ave Project's public space. Links after the jump. 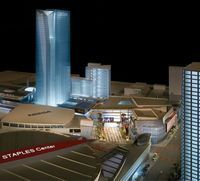 Mandarin Hotel via Business Wire "This is great news for Grand Avenue and for downtown Los Angeles,” said Eli Broad, chairman of the Grand Avenue Committee that has overseen the management of the redevelopment project for the past five years. “We are pleased with the prospect of having a hotelier of the stature of the Mandarin Oriental in what will be the most stunning high-rise in Los Angeles in the center of a burgeoning cultural district.